We’d love your help. Let us know what’s wrong with this preview of Shark Life by Peter Benchley. To ask other readers questions about Shark Life, please sign up. Was the author of this book the actual maker of “Jaws”? phoebe♡ Yes, he was the author of "Jaws". I can't believe this booktalk staple isn't in my Goodreads! It's so fun to read about the Jaws author's adventures as a beginning diver and growing shark expert. I like to read aloud his first dive on p. 10, with the caveat about shark fin soup on p. 3.
p239: we'd filmed exotic critters like red-lipped batfish, which looked like a medical experiment gone wrong, as if the body of a frog had been grafted onto the mouth of mick jagger. I really enjoyed reading this book and I learned a lot from it. I like that the author included his personal experience with sharks. As a very water oriented family that feels they could recount many underwater thrilling experiences, Peter Benchley continues to surprise us in what are sometimes funny and sometimes harrowing personal encounters under the water. I've given this book as a gift many times! Peter Benchley is one of my favorite novelists. I love his tales of adventure, especially those that involve marine life. His narrative voice is very fluid and translates well to both his fiction and non-fiction works. This is the case with Shark Life, an informative book filled with personal anecdotes of Benchley's own encounters with sharks and other sea creatures. One of the lessons that he tries to impart through much of his book is the fact that we, as humans, are simply one cog in the whee Peter Benchley is one of my favorite novelists. I love his tales of adventure, especially those that involve marine life. His narrative voice is very fluid and translates well to both his fiction and non-fiction works. This is the case with Shark Life, an informative book filled with personal anecdotes of Benchley's own encounters with sharks and other sea creatures. One of the lessons that he tries to impart through much of his book is the fact that we, as humans, are simply one cog in the wheel of the natural world. It is our duty to treat the earth and its lifeforms with respect, especially when we are entering territory as unfamiliar as the oceanic expanse. Multiple times Benchley mentions how we need to remember that nature contains order, and when we disrupt that order it sometimes can have devastating effects on the ecosystem and our communities. We oftentimes blame nature for its destructive capabilities without reflecting upon the hand we may have played in helping to create that destruction. This book was a riveting read, even though it's presented in a factual straightforward manner. The book did a good job of detailing what different types of sharks are dangerous ( as well as other sea creatures). Also the author gave detailed good description of what threats are faced due to overfishing and other issues facing our oceans wellbeing, which has only become considerably worse since the book was published. It was interesting to read about all his adventures out on the ocean involving these heavily misunderstood creatures. Sharks are dangerous, but aren't the demons of the sea that they are often portrayed as. He teaches you a lot about them with several stories and tells a story that backs up how the are integral to the balance of nature in the ocean. If you like sharks and like Peter's work, it's a great read! This book is not an in depth look at sharks despite the title, nor does it largely focus on the life of the author of Jaws. Its a random smattering of sea creatures humans fear, from orcas to jellyfish, mixed in with personal stories from post-Jaws fame filming TV shows about the ocean. Lack of cohesion, aside from the general ocean topic... What were the chapters about staying safe in currents in there for? Most non-biologists who are lovers of the sea will find it interesting enough anyway. Actually, I’d give this one a 5-star rating, but I am reserving that rating for my favorites. Excellent book. Easy to read, and it’s a nice introduction to both sharks and various other kinds of marine life. That’s what it is though... an introduction. Do not read this and expect to become an expert on sharks afterwards. I'll admit, it was a little slow at the beginning and it took me three tries to get into this book. However, once you get into it, it's a great read. I really enjoyed learning about sharks and the other amazing creatures featured in this book. Great for kids or adults. This is a very good book. Peter Benchley really finds ways to make you care about sharks and other sea life. This was a collection of stories from Benchley’s dives and personal experiences. It had some good info and some entertaining tales! This was a good book that was more about ocean life and human perceptions rather than just sharks. It was an interesting quick read. I really enjoyed this book, which I picked up off the shelf at the beach house I stayed at. It seemed morbidly appropriate for beachside reading. The stories are fascinating. The topic, of course, is irresistible: who isn't curiously awed by ocean life? Benchley has made a career underwater--both as a writer and a diver. He swims all over the world with all kinds of marine life (intentionally and otherwise) and various shark species--sometimes swarms of them. These are the true-life experiences h I really enjoyed this book, which I picked up off the shelf at the beach house I stayed at. It seemed morbidly appropriate for beachside reading. The stories are fascinating. The topic, of course, is irresistible: who isn't curiously awed by ocean life? Benchley has made a career underwater--both as a writer and a diver. He swims all over the world with all kinds of marine life (intentionally and otherwise) and various shark species--sometimes swarms of them. These are the true-life experiences he tells about, along with pertinent and engaging facts about these underwater creatures. His stories are incredible and sometimes eerie. Once or twice I even had to remind myself, "Well, you know he doesn't die, because he writes about it." The guy has guts. What the title doesn't indicate is that Benchley takes it upon himself to offer swimming and safety tips. If that was the worst of it, I wouldn't mind. The info is interesting and potentially useful. He's a good writer, so even the instructional part is easy reading. I had to knock it down a couple notches for Benchley's preaching. He feels it necessary to interject with marine conservation and etiquette plugs throughout the story...as if I, the reader, while leisurely perusing the pages from my beach chair, might be endangering his favored habitat with my curiosity. I'd be more forgiving of his opinionated intrusions if they weren't so hypocritical. He's like, "Don't support or participate in fish-feeding/petting attractions because it will destroy the ecosystem and might possibly one day become dangerous." He, however, hand-feeds fish and sharks all the time. He even takes his kids to a tourist feed-and-swim-with-dolphins, which he rationalizes because it's a "better" program than the others and he is mostly doing it as an educational experiment to learn just what negative repercussions might result from such an activity. How condescending. (*Newsflash: hmmm, pretty sure those feeding spots use fish from the natural food chain, meaning food the fish would have otherwise eaten on their own. So I'm not sure that a major or irreparable ecological upset is going to ensue.) Another favorite caution of his: "Don't ever try to seek out or swim with sharks cuz they're dangerous and don't want to be bothered." (I guess I'd be more concerned about the "dangerous" part than the notion that sharks have preferences about what organisms they share their water space with.) He is an elite diver, and so swims with them and even takes his pre-teen kiddo diving into a throng of sharks. But shame on me for having the same aspirations. (Don't worry--that prepubescent son of his was very experienced--apparently more than I could ever hope to be.) Or maybe he is exempt because he advocates for the sharks and should therefore be entrusted to roam the waters at will. I'm not really eager to swim with an animal that can--and might--swallow me whole, but for all he knows I am capable of doing so. i think this was a very good book. it informed me on the dangers of the sea. it also taught me a lot about sharks and the exciting lives they have. This book is written by a kind of famous person. This is the author of the book jaws. He also wrote like 10 other famous books about the ocean. This book tries to reverse the feelings of the people that were thought when he came out with the movie jaws. He states many stories about him swimming with sharks. He states in this book that he swam with sharks and has only been attacked by a shark once. He also said many things about sharks that many people would not expect like he said that there are hundreds of species of sharks yet only 6 are dangerous enough to hurt humans. This book helps me understand how we get attacked because we go swimming in their home and interfere inside their food chain. The author also said a lot of other animals that live in the ocean and are dangerous to show that the sharks not the only dangerous animal in the giant unexplored ocean. I think this book taught me a lot about how we overreact to things that aren't even very common. Also this book was very informational and helped me learn a lot about animals in the sea. This author uses very persuasive words to have more people agree with what he is saying and I agreed with most of the book but some things he did were just plain stupid. I think he is very dumb to pet sharks swim with killer whales and dive with the most fearless animals in the ocean. This book helped me understand what he was saying in the movie jaws because he didn't to make everyone scared he wanted to make the shark so big no one would be scared of it and they would enjoy the movie but this plan had backfired to him. This is a good book and now I appreciate the ocean even more. Shark Life is all about...sharks!!! (non-fiction) Written by my personal hero, Peter Benchley. This book has information about sharks ranging from 10 most deadliest to shark attack stories. Shark Life also spends time explaining how you can lessen your risk of getting attacked by sharks. An interesting fact that it states is that the biggest fish/shark eats one of the smallest..plankton! Which I personally believe everyone is relieved by, especially considering many lucky divers get to ride on the back of this magnificent creature. With all the information that is given the book mentions a very important subject, shark finning. Which is the killing of sharks for their fins for our selfish needs. Another conflict other than finning was when he was in South Australia filming for a tv program and was in the shark cage. A great white came and almost being unattached to the boat and the weight of the cage dragging him down to the depths! I gave this book five stars. As a shark obsessionist, I learned tons and was interested in everything I read. Especially being written by an amazing marine biologist such as Peter Benchley! I was wrapped in the novel especially during his stories of his adventures at South Australia. He also had pictures which just showed how increadibly massive some sharks are! I really enjoyed every thing but the part that really made me in love with this book is the top ten deadliest sharks, Great White as number one! Shark Life is intended for young adult readers but I would recommend it for anyone looking for a quick captivating introduction to sharks. Written by Peter Benchley, the bestselling author of JAWS, Benchley shares his 40 years of diving experience with readers alternating between facts and remarkable first hand encounters with a variety of sharks. It is well written and as with all good writing has some unexpected surprises thrown in for good measure. Benchley is an enchanting writer and knows h Shark Life is intended for young adult readers but I would recommend it for anyone looking for a quick captivating introduction to sharks. Written by Peter Benchley, the bestselling author of JAWS, Benchley shares his 40 years of diving experience with readers alternating between facts and remarkable first hand encounters with a variety of sharks. It is well written and as with all good writing has some unexpected surprises thrown in for good measure. A book about sharks is the perfect beach read. Especially when you plan to actually spend time in the [deep] water. I had been determined to go vestless for the first time in a snorkeling trip, but after reading this book a few hours before the plunge, I felt compelled to stay in the boat for the rest of the day/vacation/my life. Curiosity beat fear, though, and with the help of a friendly guide I was able to snorkel, vestless, in and around a thriving 30-foot-deep reef. Not very impressive, but A book about sharks is the perfect beach read. Especially when you plan to actually spend time in the [deep] water. I had been determined to go vestless for the first time in a snorkeling trip, but after reading this book a few hours before the plunge, I felt compelled to stay in the boat for the rest of the day/vacation/my life. Curiosity beat fear, though, and with the help of a friendly guide I was able to snorkel, vestless, in and around a thriving 30-foot-deep reef. Not very impressive, but for a first timer who just read a book about sharks (and numerous other deadly sea creatures), it was a great feat. Shark Life deserves 5 stars simply because the author knows what he's talking about: he has written several novels about sharks and the sea, and with those came hours of reading, interviewing, researching, and eventually, experiencing life in the water. Here he includes numerous anecdotes, some of which are hard to believe, but never impossible. I like how he balances terror with awe. Other potentially harmful creatures like eels, squids, jellies, urchins, and whales are also lightly discussed. Those were thoughtful additions, and gave a scientific look into an otherwise simple, yet effective storytelling. The best part was his integrity and advocacy about marine life in general, not just sharks. This is a non-fiction book written by the author who wrote the most famous shark novel Jaws. After writing Jaws he challenged himself to learn the truth about sharks and their habitat. This book compiles his research and first hand accounts dealing with this magnificent creature. This book was a quick read and it held my interest throughout. It not only dealt with sharks but other sea creatures. He does a wonderful job of painting the picture of how the ocean is awe inspiring and deadly at the sa This is a non-fiction book written by the author who wrote the most famous shark novel Jaws. After writing Jaws he challenged himself to learn the truth about sharks and their habitat. This book compiles his research and first hand accounts dealing with this magnificent creature. This book was a quick read and it held my interest throughout. It not only dealt with sharks but other sea creatures. He does a wonderful job of painting the picture of how the ocean is awe inspiring and deadly at the same time. He gives facts about these creatures and offers advice if we ever come in contact with creatures of the sea. But what really sold me on this book was his personal anecdotes. They were simply amazing and wonderful. His experience with a killer whale alone is enough reason to read this novel. Some of his experiences were terrifying and it adds to the message of this book. We are invading their turf and animals are acting naturally. 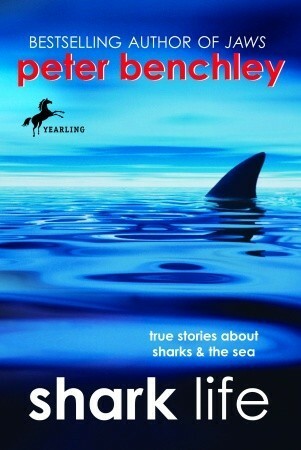 The book I read is called shark life by Peter Benchly, who is also the protagonist fo teh book. The book starts out in the middle of the ocean with Peter in a cage and sharks attacking him. Then the story goes back to before he was asked to do that job. The protagonist main problem in the story is trying to survive from being in the ocean and finishing his movie.When he's out in the middle of the ocean and he thinks his movie that he is starring and producing in "Jaws". After a couple of hours P The book I read is called shark life by Peter Benchly, who is also the protagonist fo teh book. The book starts out in the middle of the ocean with Peter in a cage and sharks attacking him. Then the story goes back to before he was asked to do that job. The protagonist main problem in the story is trying to survive from being in the ocean and finishing his movie.When he's out in the middle of the ocean and he thinks his movie that he is starring and producing in "Jaws". After a couple of hours Peter stops stressing about sharks and finds out they aren't paying attention to him so he relaxes, when everything is fine he turns and hears a noise to find out something has been here the whole entire time. My opinion about the book is that he was suprised and frightened for nothing when he should have been worrid about what was following him. My details are that Peter kept hearing something coming towards him but he ignored it and thought it was a fish. Another is he realized he was in trouble when the boat was getting farther and farther away. If you want to know what happens next read the book. Peter Benchley, writer of Jaws, did a great job in writing the book Shark Life. He takes his own experiences and shares them here in the book. He also gives some information tips for your safety in the ocean, where you are trespassing the environment of many fish. I would recommend this book if you want to learn about encounters with sharks and being safe in the ocean. Or to further knowledge on sharks and get a little background on Peter Benchley. It really just depends on you if you’d liked to know background of Benchley's inspiration to writing Jaws. This book earns four stars because it’s personal experiences. It is not exactly all about sharks. But it still entertains you with Benchley's true stories. This bok gave me a new perspective of sharks. I've always had a small fear of sharks until I learned the reasons behind shark behavoir due to Peter Benchley's data. Enjoy this book because I really did enjoy learning more about sharks. I'm already fascinated by great whites, so this book was interesting, with it's personal encounters with sharks. However, there was a comment at the end: "There is no public outcry to get rid of any animal because it is dangerous to humans. Australians have learned to coexist in relative peace with nearly everything. When occasionally a human life is lost to an animal, the public's reaction is usually thoughtful and rational." THIS IS COMPLETE BS. Australians are just like any other human populat I'm already fascinated by great whites, so this book was interesting, with it's personal encounters with sharks. However, there was a comment at the end: "There is no public outcry to get rid of any animal because it is dangerous to humans. Australians have learned to coexist in relative peace with nearly everything. When occasionally a human life is lost to an animal, the public's reaction is usually thoughtful and rational." THIS IS COMPLETE BS. Australians are just like any other human population on earth, there are those that understand the nature of wild animals and those that want the government to continue it's horrendous shark cull.